I want to do a quick highlight of a fantastic cookbook I picked up while visiting Wayne's family in Philadelphia last August. 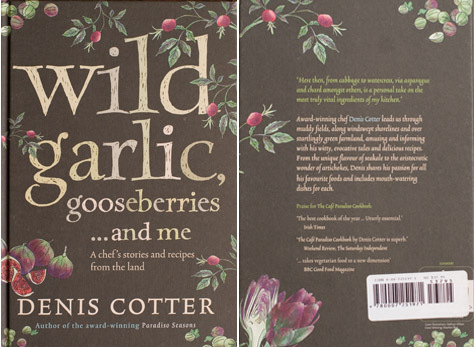 Truth be told, I picked up a few books, but Denis Cotter's Wild Garlic, Gooseberries and Me was one of them. 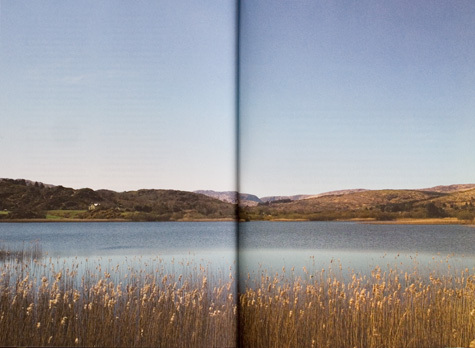 It is a beautifully crafted volume featuring chef Cotters' passion for the farm-fresh, vegetarian ingredients available to him in his native Ireland. Denis is the much celebrated chef at Café Paradiso and this Borlotti Bean Mole with Roasted Winter Squash is indicative of the type of recipe you'll find throughout the rest of this volume - seasonal and flavorful. 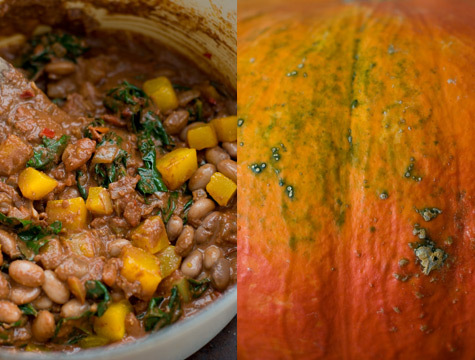 In this case, beans, squash, and kale are baked in a rich, hearty chocolate and paprika-spiked mole. In many regards - size, scale, design, and vibe, it reminds me of a vegetarian version of Nigel Slater's Kitchen Diaries, another beautiful book. Cotter and Slater's writing styles are notably different, but if you like the design of Kitchen Diaries, and are looking for a new swatch of veg-centric recipes, this book is well worth exploring. I've earmarked - Beetroot and Pomegranate Tabbouleh with Orange-marinated Feta, Rosehip Syrup, Watercress Hummus, Green Seakale with Orange, Tomato and Fresh Sheep's Cheese, Roast Sunchoke Risottto with Lemon-thyme Oil. There are lots of others too. 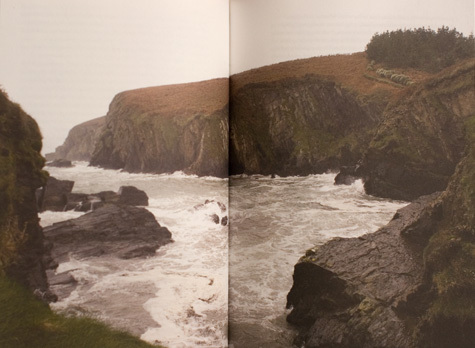 Cristian Barnett's photographs are beautifully represented on thick, uncoated paper stock throughout the book. Wild Garlic, Gooseberries and Me includes a mix of simple preparations, alongside more intensive, chefy, component-driven main-dish type recipes. Not a huge number of one-pot preparations, but there are many recipes included where I could see using individual components, or cutting corners on some of the preparation methods. There are a lot of really great ideas here, and Denis uses ingredients in combinations that might never have occurred to me. I have the sense that because this book was originally published in the UK by Collins, an imprint of HarperCollins it might not have much distribution here in the U.S. Aside from the day I purchased it, I haven't seen it in stores - but it seems there are a few copies stocked at Amazon, and it has the "look inside" feature enabled, in case you'd like to take a closer peek. I should also mention that the book uses measurements in ounces and grams - no "cups" to be found. I made a few tweaks to the original recipe, primarily to communicate amounts in a way that is a bit more approachable to American cooks. If you don't have fresh beans on hand, cook up a pot of dried ones. If you can't find borlotti beans feel free to substitute pinto beans or another bean of that nature. Chiles can vary in heat, so if you are sensitive, start with less, you can always add more later on in the cooking process if you like. Dennis recommends serving this mole with tortillas, polenta, mashed potatoes, or potato cakes. Preheat oven to 180C / 350F / Gas mark 4. Bring a large saucepan of water to a boil, add the borlotti beans and cook for about 10-15 minute until they are just cooked or even slightly undercooked. Drain and cool under cold running water, and set aside. Without removing the central stem, cut the kale across the leaf into 2cm / 3/4-inch slices. Melt the butter into an oven-proof casserole dish (pot) and fry the onion and chilies gently over a low to medium heat for 20-30 minutes, until caramelized. Add the garlic and fry for three minutes more. Add the tomatoes and paprika, bring to a boil, reduce the heat and simmer gently for 15 minutes. Add the ground almonds, chocolate, squash, borlotti beans, kale, and a teaspoon of salt. Stir until the chocolate has melted. Cover the casserole and put it in the oven to cook gently for 2 hours.